This is an Associated Press story, yet I believe its distribution was regional to central New York… the local angle is my recent stop in Jamesville (near Syracuse, just down Interstate 81 from Waterwown). I stayed a few days there with my old friend Jean Polly and her family, and was on one of my extended speaking tours with the now-retired BEHEMOTH packed into a mobile lab. The Microship project was yet to find a home, though I was thinking about it… the last line of this story references an amphibious kayak. JAMESVILLE—Steve Roberts always hated the thought of being anchored down in an office. So he took to the road to find success—literally. Roberts, who lists author and consultant at the top of his resume, combined his life’s passions into a profitable business: traveling the countryside on a bicycle. Not just any bike. BEHEMOTH—”Big Electronic Human-Energized Machine, Only Too Heavy”—is an eight-foot, $1.2 million medley of electronics and engineering weighing 580 pounds. It has 105 gears and is outfitted with a satellite dish, a computer and display screen, a ham radio, a cellular telephone, a CD player, equipment to send and receive live video and solar panels to power the electronics. “These are all things that nail people to a desk or to a zip code,” said Roberts, 39, a high-tech nomad who has no permanent address. “I’m showing how you can be productive while being nomadic. If you’re plugged in, you can make a living,” he said. Roberts has logged 17,000 miles since selling his house in Columbus, Ohio, and pitching away a conventional lifestyle in 1986. He wrote a book, “Computing Across America,” in 1988 about his first 10,000 miles on the road and is working on a second one. He also writes technical books, freelances magazine articles, publishes his own quarterly magazine called “Nomadness” and delivers speeches. “I got into a familiar pattern and finally said enough is enough,” said Roberts, who was staying the week in Jamesville with friends Jean and Larry Polly, two of the network of nearly 5,000 friends he’s met through his computer’s electronic message board and his travels. Most of the equipment aboard BEHEMOTH was donated by computer and engineering companies who use Roberts for engineering feedback and publicity. His story’s been chronicled in newspapers across the country, in major magazines and on network television. He was interviewed by Tokyo Broadcasting System during his stay in Jamesville. “I approach them when their product is a solution to a problem. It’s a way to show them how their technology can be fun, interesting and alive,” Roberts said. BEHEMOTH, now in its third and final version, can reach speeds of up to 50 mph going downhill. Cruising speed is about 9 mph. 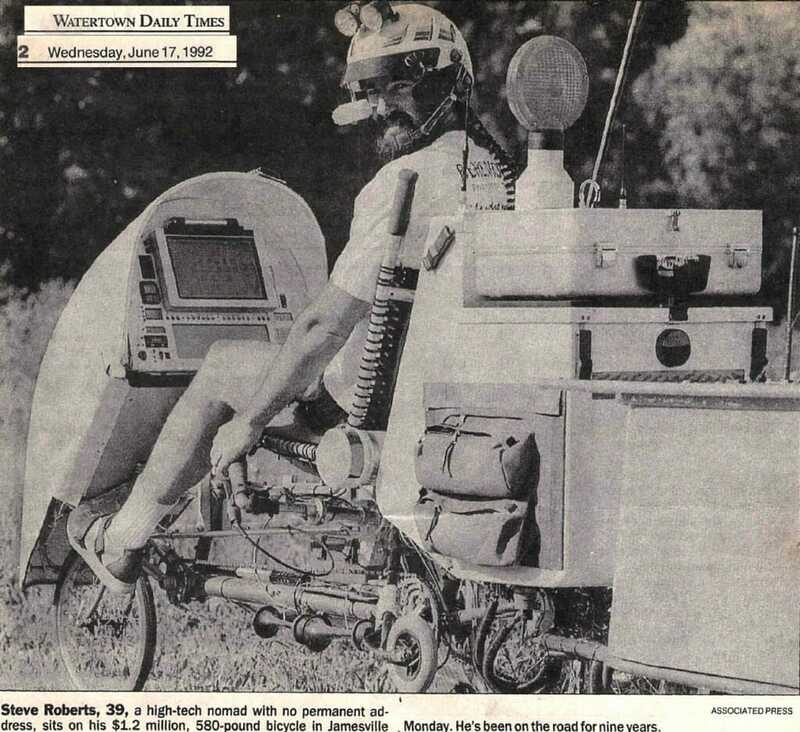 Its recumbent style allows Roberts to pedal with the full strength of his legs without strain on his back or neck. The steering bars are located on each side under the seat, allowing Roberts’ arms to hang relaxed. He can operate the computer keyboard through binary-coded buttons on the steering bars or by voice command. He also has a water-cooled helmet that’s equipped with a miniature display screen that pulls over his right eye, a microphone and a computer mouse that lets him move the cursor with a tilt of his head. “It shows there’s no need to be in an office,” said Roberts, who is headed to Boston next. BEHEMOTH even has a security system that will dial 911 and use the computer and a voice synthesizer to report itself stolen to police, giving them its location within 50 feet of the exact longitude and latitude. The voice synthesizer has led to some funny moments, Roberts said. Using a portable radio transmitter, Roberts has occasionally had an unoccupied BEHEMOTH talk to passersby while he watches from afar. Roberts, who has been towing BEHEMOTH between cities on his current business trip, is planning another major cross-country trek beginning this summer in Colorado. But that may be the end of the road— although not the end of Roberts’ sojourns. “I’m getting tired of the road. Too many dangers, hills and bumps,” said Roberts, whose newest design is for an amphibious kayak.